Ceramic tiles have been used on countertops for over a hundred years in this country. In the old days (or as my kids would say, “back in the day”) mosaics, some of them hexagonal, were often used for the “drainboard” itself, and bulky trims called “box caps” were used for the front edge of the counter. In many cases the drainboards were actually tilted or sloped toward the sink. 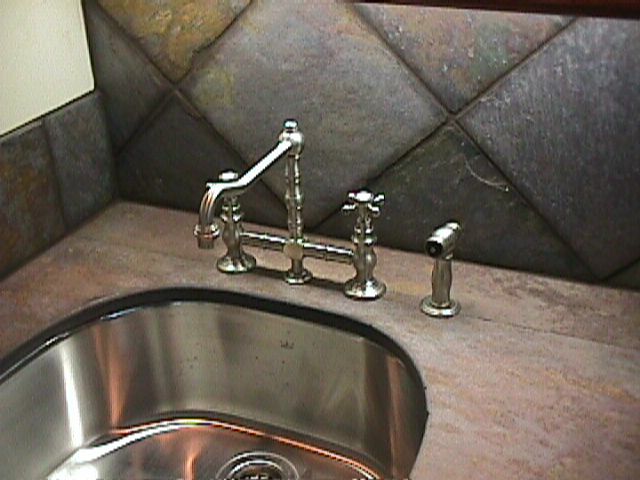 A few of these installations have been preserved and are still in use in older homes. At the time I entered the tile trade we were using wall tiles for drainboard work. Wall tiles did not hold up well at all. For the most part, we don’t have “drainboards” anymore: we have countertops instead, and seldom are mosaic tiles used on their surfaces, even though porcelain mosaics remain one of the toughest materials in the tile trade. They seem to have fallen out of favor about forty years ago. Wall tiles shouldn’t have been used, period. Nowadays, people who have tiles on their countertops seem to prefer tiles much larger than mosaics, even though the larger pieces might not be as durable. For my part, I don’t care for tile countertops. I have tile tops in my home but would rather have a solid surface material on the counters with tiles on the backsplash only. Tiles on counters take a lot wear, and the grout joints are nearly impossible to keep clean. You must be very careful how you put things down on the counter, or you will chip or scratch the tiles. Nah, it’s not for me. Fortunately, the trend seems to be away from tiles on the counters themselves. The preference seems to be for solid materials; if not laminate, then solid plastics such as Corian and Wilsonart. Silestone (a granite-like material) and natural granite are also quite popular. Avanza, another granite-like surface material, is coming on strong also. 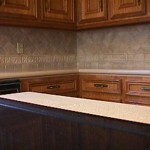 When the counter surface is in place , a tile backsplash is usually installed. The tiles on the splash can be installed right over sheetrock, since they will not take any abuse. Nor will they be subjected to any appreciable amount of moisture. Having to cut tiles down to smaller sizes will cost you extra. In the trade this is referred to as “making little pieces out of big pieces.” Fancy inlays will also increase the cost of labor. One thing that will definitely run up the cost is having to install things made from river rocks down in Mexico. These pieces are tedious to work with, and they are expensive to boot. They certainly are unusual, though. I’ve installed them mostly in show homes. Materials for countertops and splashes average much more than materials for floors, for example. Many of the pieces used are “shapes,” trim pieces, including bull nose. Trim pieces are always sold by the piece. Imagine all the counter edges, the ends of the splashes and the bull nose pieces needed at window sills . . . to say nothing about decorative borders, listels, liners, and other inserts. When you are designing your backsplash, keep in mind that electrical outlets and switches have to be negotiated and that they are often in the path of the border or liner you want to use. You should always plan the border to run under these obstacles. Borders and liners installed above electrical outlets will often be lost from view because of the upper cabinets. In my opinion (though I’m not a designer), borders should never run through obstacles. 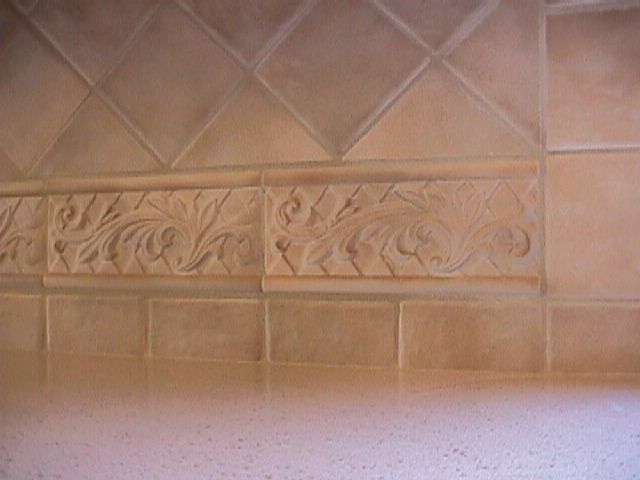 Nor should decorative tiles be cut. If you would have to cut them to get them in, omit them instead. The finished product will look much cleaner and more professionally done. On some of the new custom homes I’ve worked on, the outlets and switches are installed on the undersides of the upper cabinets where they are out of site completely. 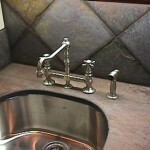 It makes them a little hard to find when you need them, but it vastly improves the appearance of the backsplash. 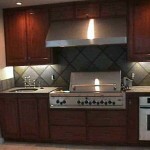 If you are building a new home or changing your kitchen cabinets, you should consider this option. 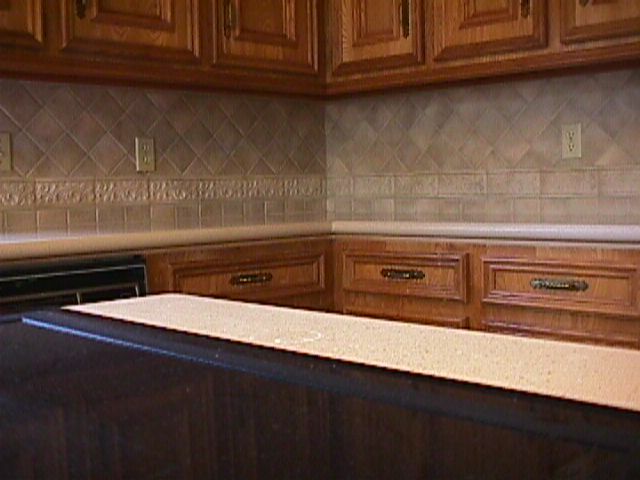 Plastic laminate (Formica, Wilsonart, Nevamar and other brands) is still a good choice in countertop material. There are laminates that don’t look like laminates, and they are much more durable than in the past. They look really great with a tile splash behind them, and they are considerably less expensive than any of the other materials I’ve described. The poor man’s road to elegance? Well, count me in. 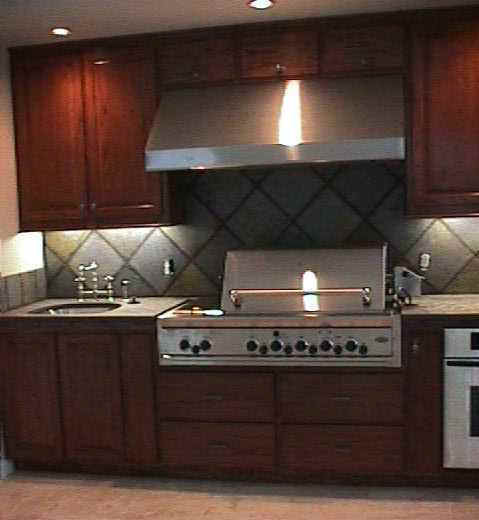 It seems tiled countertops may be on the increase, at least in certain parts of the country. The development of Kerdi-board by Schluter Systems has made tiled tops easier to construct. If you want tile on your countertops ask for this product to be used as the base in place of plywood. Schluter Systems. For expert Kerdi-board advice and installation help, visit us at the John Bridge Tile Forums. 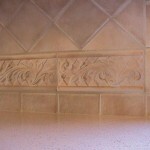 Here are photos of a couple of splashes we’ve done.